A tiny baby Siamang made her debut this week. Cahya was born to Leela and Merlin late last summer, however, shortly after the veterinary staff noticed that Leela was no longer carrying Cahya. As the last result, the keepers decided to remove Cahya from her parents and make a baby room in the parents larger room. Keepers stay close to Cahya to keep her development going and help her learn to climb, feed and play. Visitors can view Cahya every day at the indoor habitat from 9:30AM-2PM and then in the outdoor habitat from 2:00PM-3: 30 PM. Just on the hill above the Siamang is the BIG attraction for the spring: a biplane through the jungle. As the final part of Jungle Odyssey, the zip line flies hight above some beautiful plants with a view of the entire zoo. The 170-foot long flight is about two stories up. Riders must be above the age of 6 and under 250 pounds. Riders must also sign a waiver. The zip-line officially opens May 26 and runs through Labor day from 10AM-5PM daily. The Jungle Odyssey is the latest section of the zoo to open and includes a Pigmy Hippo and a Fossa. Shortly after we published this piece we got additional news. The Pittsburgh Zoo and Aquarium welcomed more babies. The Canadian Lynx gave birth to 5 kittens. They are not on exhibit yet and Mom and kittens are bonding in the nest. 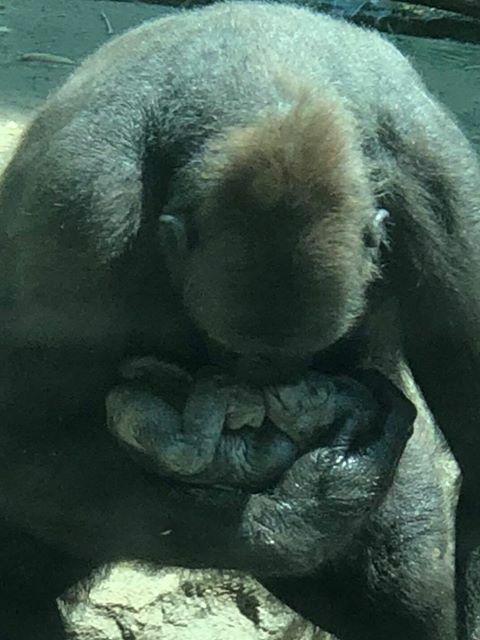 The Zoo Keepers also welcomed a new baby Gorilla. Moka gave birth for the third time while on exhibit. It gave the visitors quite a show and shortly after Keepers called the family inside to ensure mom and baby were doing well. Western Lowland Gorillas are endangered due to poaching and loss of habitat. This is Moka's second child on exhibit at the zoo. Moka is also mom to 5 year-old Ivan. Both additions are amazing sights that will highlight your next rip to The Pittsburgh Zoo and Aquarium. For more information visit pittsburghzoo.com. Shorty after we published this piece we got additional news. The Pittsburgh Zoo and Aquarium welcomed more babies. The Canadian Lynx gave birth to 5 kittens. They are not on exhibit yet and Mom and kittens are bonding in the nest.